☞ The number of Christians in America (and one should add, elsewhere in the western world as well) is declining. This article proffers an explanation for this, using storytelling — or the use of convincing and relevant narratives — as a reason for the decline. “These reasons for this movement [more Americans have no religious affiliation] are complex, but I want to suggest two that are critical. First the great cultural shift toward narrative rather than static concepts has left a lot of our religious language sounding irrelevant to the ways people construct their self-understanding. Many, too many, Christian churches don’t have a story to tell. They are communities of doctrines, ideologies, or even relationships whose origins are obscure and that are going nowhere. The second critical problem is that in an age of narrative identities even those churches with a story offer one that is simply too narrow, to exclusive, to provide a realm in which a modern young person can locate his or her own complex experience. The fundamental narrative framework of much mainline Christianity is that of conversion: from false religion to true Christianity, from personal sinfulness to redeemed holiness, from callous indifference to real commitment, from irrelevant old ways of thinking to contemporary relevance. When one joins a church one is joining a community of the converted, and joining in the story of converting the rest of the world. Analysis of the two Christmas stories in the New Testament | Daniel J Harrington, S.J. “The New Testament contains two Christmas stories, not one. They appear in Matthew 1–2 and Luke 1–2. They have some points in common. But there are many differences in their characters, plot, messages, and tone. In the familiar version of the Christmas story, Mary and Joseph travel from Nazareth to Bethlehem. Because there was no room in the inn, the baby Jesus is born in a stable and placed in a manger. His humble birth is celebrated by choirs of angels and shepherds, and he is given precious gifts by the mysterious Magi. This version freely blends material from the two biblical accounts. It has become enshrined in Christmas carols and stable scenes as well as the liturgical cycle of readings during the Christmas season. 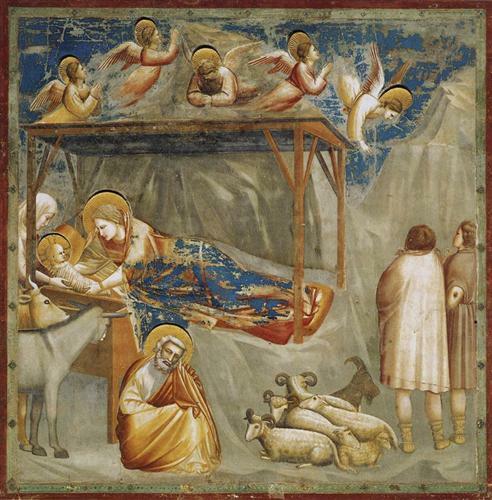 Giotto’s “Nativity, Birth of Jesus” from Scrovegni (Arena) Chapel, Padua, Italy c. 1304-1306. ☞ Fr Harrington argues that the two Christmas stories in Matthew and Luke need not always be blended together, but there are virtues in looking at them separately. By doing this, the contexts in which they were written would be better appreciated, and there would also be a better understanding of the respective writer’s intentions. What this article emphasises is the importance of the appropriate contexts in reading religious narratives.